ZAK TRUSCOTT has earned in the junior snooker league record books at Waterlooville Sports Bar. The 14-year-old is the first of the players who began their green-baize careers in the Monday or Wednesday sessions to record a half-century break in competition. Truscott, who is sponsored by Lead Generation Services and works with World Snooker coach Tim Dunkley, stroked in a 52 against Tom Shuttle this week. It was 19 months ago that Truscott made his debut in the Wednesday league in the second week of the first season on December 21, 2016. Seven days later, he knocked in a personal best break of 11. 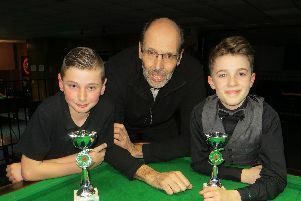 This is further proof that junior snooker at Waterlooville Sports Bar is going “from strength to strength” as Dunkley told players and parents attending the trophy presentation for the fourth season of the Wednesday league. Club owners Suzy and Steve Wilson, who presented trophies to the top 14 players, and league organiser Dunkley said how proud they were of the continuing success. The players were challenged to finish in the top 10 of the Cuestars club rankings last season. And they finished runners-up. Wednesday league champion Samuel Laxton crowned a remarkable season by winning the Cuestars bronze tour championship play-off in Swindon. And Laxton, Dean Russell, Truscott and Harry Wilson have earned promotion to the Cuestars silver tour. Dunkley said: ‘We are all so proud of what the players have achieved. The standard is going up and up all the time. ‘Junior snooker in this area is going from strength to strength. ‘All the hard work pays dividends. It’ll be exciting to see where we are at the end of next season. Meanwhile, pool league leader Jamie Wilson was undefeated and extended his advantage over second-placed Jayden Brookes to 20 points with five weeks left. Soon-to-be England international Wilson then made the highest break in the history of the Monday Junior Snooker League. The 14-year-old had a run of 85 against Harvey Dunsmore. Patrick Elliott celebrated his 13th birthday as he chalked up a personal best 16 break in the Wednesday league. Russell leads division one by two points from Laxton. Antony Terroni heads division two. Ryan Wilson is the front-runner in division three. Dunkley runs snooker sessions for under-19s from 4.30pm to 6.30pm every Monday and Wednesday and junior pool sessions from 4.30pm to 6.30pm every Thursday.